I am always on the lookout for interesting tapas and this is one of them. I love how it can be put together quickly and that it can be versatile. I used a pumpkin orange jam but you can use strawberry, raspberry or any flavour you want to try. 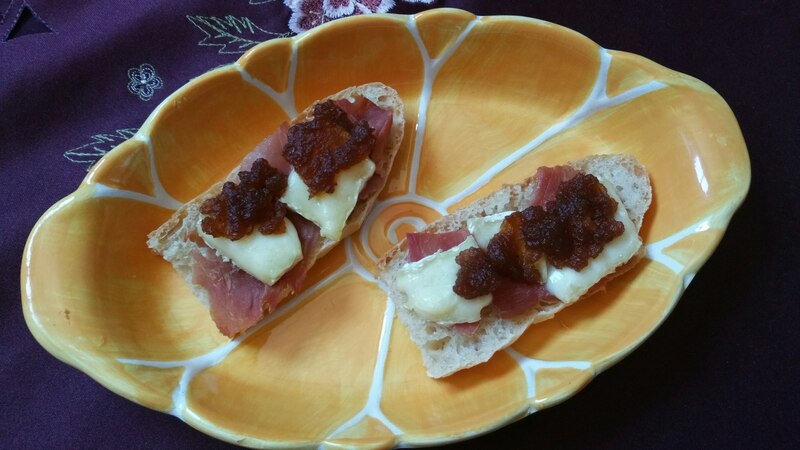 I used a serrano ham, which I quite like because it is a bit salty. It adds to the flavour. I don’t like the cheese too melted because it is too stretchy. I just warm it up a bit. But that is a matter or preference, so you decide. Put the slices or pieces of ham on the bread. Add one or two pieces of Brie. Add a small spoonful or two of jam on the top. Place in the oven for 10 to 15 minutes at 175° until the cheese is melted the way you like it. I always say this but times and ovens are different si although the differences in time won’t vary enormously, keep an eye on them. I will post the pumpkin orange jam recipe soon, if you are interested. Hahaha! I love that term! I think I will start using it 👍😆Thank you!